Mission San Jose Elopement. 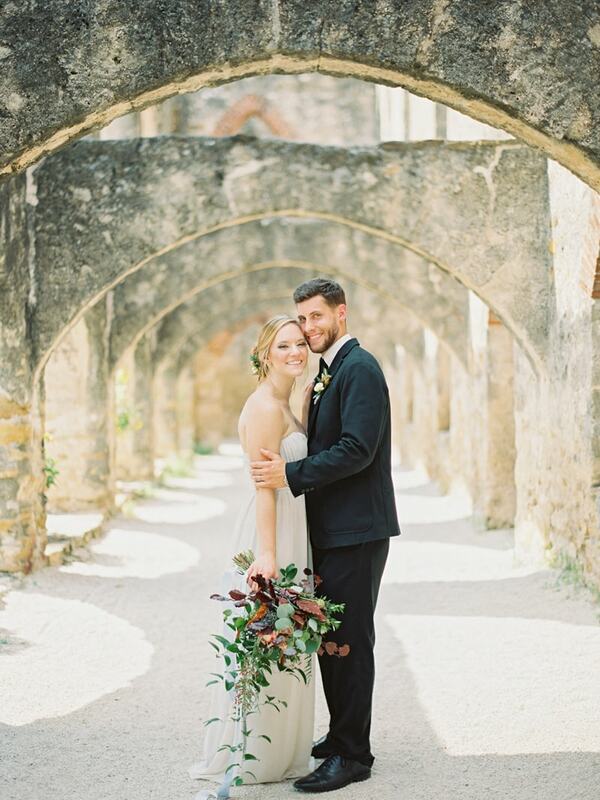 The historic Mission San Jose in San Antonio, Texas, provides the perfect location for this elopement styled shoot. The historic mission grounds and bright Texas sunshine only adds to the radiance of this beautiful couple, who project love and affection in every single shot. Old world antiquity and modern romance are the central themes of this shoot. The bride evokes that perfectly with her rosy-colored peep toe heels to kick off her bridal look. A sweet and simple invitation suite featuring handmade, textured pieces is all that’s needed for an elopement set out in this enchanting, one-of-a-kind atmosphere. To complement the Texas heat, the bride looks stunning in a strapless gown and wears her hair in a beautiful updo with floral accents. Her bouquet features blooms that span the spectrum from blush pink to burgundy and is tied with hand-dyed cotton ribbon strands. The bride looks angelic in her strapless, sweetheart gown, dewy makeup and beaming smile. One of the small touches that brings this shoot to life is a vow journal that can serve as a perfect keepsake long after the day is through. The groom is the definition of classic and modern with his black suit and sleek black tie. Together, these two are a magnetic pair, injecting a youthful, refreshing energy within the 1782-era walls of the mission. A ceremony scene is set under an archway. Candles, protea, and greenery line the stone steps and a table with a candelabra is placed at the center. The couple express deep emotions as they stand face-to-face at this intimate spot. They pause along a long, open-air corridor where they are all smiles as the sunshine rains down on them. The white sweetheart table features vintage and modern touches that create a unique and exclusive look. A hand-dyed cotton table runner and napkins, along with elegant wooden chairs, and modern plates are paired alongside a gorgeous centerpiece and dark taper candles. 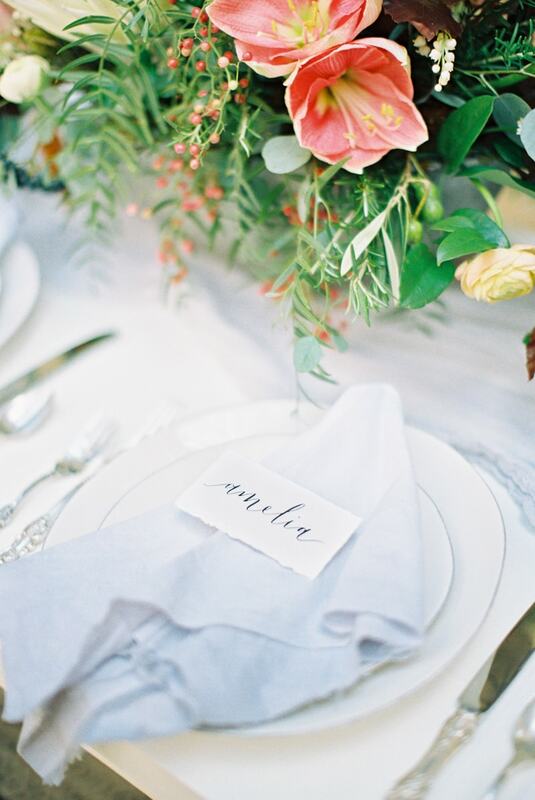 Family heirlooms like antique silverware and goblets complete the modern-meets-vintage style. For a sweet finish, a delicious Chantilly cake with berries rests alongside more draping florals nestled in a gorgeous nook in the historic architecture of the mission. Elopements are intimate and sacred. And in a location as moving as the Mission San Jose, a couple can cultivate a truly rich and spiritual experience that speaks directly to their souls. Old or new, the perfect venue is out there for one of the most romantic, courageous ways to say "I do."